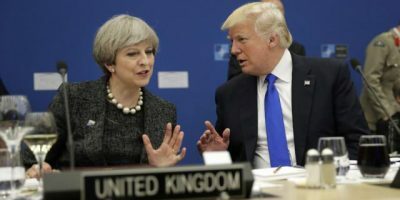 Theresa May has said she regards Donald Trump?s announcement that the United States recognises Jerusalem as the capital of Israel as unhelpful to prospects for peace in the region. The Prime Minister said she disagrees with the president?s decision and reiterated Britain?s position that the city should be the shared capital of Israel and Palestine in a negotiated two-state solution. In a White House speech, Mr Trump said his move ?marks the beginning of a new approach to conflict between Israel and the Palestinians? and that it was in America?s interests. Mrs May said: ?We disagree with the US decision to move its embassy to Jerusalem and recognise Jerusalem as the Israeli capital before a final status agreement. ?We believe it is unhelpful in terms of prospects for peace in the region. The British Embassy to Israel is based in Tel Aviv and we have no plans to move it. ?Our position on the status of Jerusalem is clear and long-standing: it should be determined in a negotiated settlement between the Israelis and the Palestinians, and Jerusalem should ultimately be the shared capital of the Israeli and Palestinian states. ?In line with relevant Security Council Resolutions, we regard East Jerusalem as part of the Occupied Palestinian Territories.? She added: ?We share President Trump?s desire to bring an end to this conflict. ?We welcome his commitment today to a two-state solution negotiated between the parties, and note the importance of his clear acknowledgement that the final status of Jerusalem, including the sovereign boundaries within the city, must be subject to negotiations between the Israelis and the Palestinians. ?We encourage the US Administration to now bring forward detailed proposals for an Israel-Palestinian settlement. ?To have the best chances of success, the peace process must be conducted in an atmosphere free from violence. We call on all parties to work together to maintain calm.? Labour leader Jeremy Corbyn described Mr Trump?s move as ?reckless?. He tweeted: ?Trump?s recognition of Jerusalem as Israel?s capital, including occupied Palestinian territory, is a reckless threat to peace. The British Government must condemn this dangerous act and work for a just and viable settlement of the conflict.? Donald Trump?s recognition of Jerusalem as Israel?s capital marks a ?historic day? and is an ?important step towards peace?, Israeli Prime Minister Benjamin Netanyahu said.